Are you looking for good-value, few-frills mid-range budget hotels in Toronto? There is a wide selection of moderately priced Toronto hotels spread evenly in downtown area. These mid-range hotels in Toronto can save you handsome amount of money without compromising comfort, convenience and security. 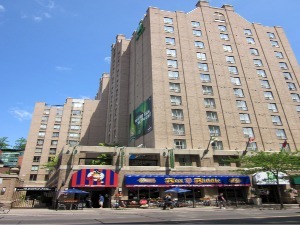 Many of these mid-range budget hotels in Toronto are situated at very good locations in downtown Toronto and few of them even occupy prime spaces in trendy and upscale neighbourhoods. With their locations close to public transit, you can easily access all major attractions and sites in the city. Apart from their locations, most of the mid-range budget hotels in Toronto offer comfortable and spacious rooms, an on-site restaurant, a fitness centre, a swimming pool, a small event space, room service and valet parking. If you go with hotel ratings, Toronto moderate hotels are mainly 3 and 3.5 star, standard hotels. Though, room rates vary significantly during peak and low seasons, the average price for mid-range Toronto hotels is somewhere between $125 - $200. If you don't want to drain your bank balance and still enjoy the best this city has to offer, here is a list of some of popular mid-range budget hotels in Toronto offering a great value for your money. 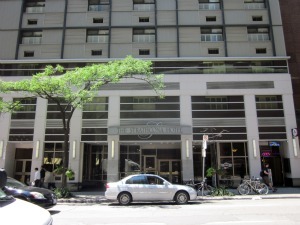 If you are looking for affordable accommodation in the Financial District, the Strathcona hotel is a great option for you. Perfectly nestled in the heart of downtown Toronto, the hotel is just steps to virtually every major attraction of the city. Air Canada Centre, Rogers Centre, CN Tower, Metro Toronto Convention Centre, Hockey Hall of Fame, Harbourfornt are short walk from the hotel. The Strathcona Hotel Toronto is situated directly across the street from Union Station, a great plus point if you are travelling by rail. With the last renovation in 2003, the hotel features 194 smoke-free guest rooms. The rooms are on smaller side, but still comfortable and very clean. The rooms offer standard amenities including Wi-Fi Internet access. The hotel offers a British-style pub and casual York Street Cafe serving delectable breakfast and lunch. It also houses 24 hour business centre. Keep in mind that the hotel doesn't have parking facility. There is no fitness centre either. But the hotel offers discounted passes to the neighbouring fitness centre. 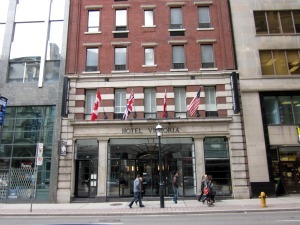 Enviably located in the heart of downtown Toronto's Financial District, the Hotel Victoria is the second oldest hotel in Toronto. Built in 1909, the small and boutique style hotel offers an unparalleled personal service. The great thing about the hotel is its prime location on Yonge Street. The hotel is only a block from the Hockey Hall of Fame. It is also very close to major attractions like the CN Tower, St. Lawrence Market, and Eaton Centre. Union Station is also just a short walk away. If you are in Toronto for a concert or sports event, then you will find that the hotel is just a perfect place to lay your head. The hotel is within 1 Km of Air Canada Centre, Sony Centre For the Performing Arts, Roy Thompson Hall, Massey Hall, Canon Theatre and Royal Alexandra Theatre. Hotel Victoria has 56 recently renovated, intimate guest rooms. The rooms are not outsized, but they are still comfortable and adequate. The guest rooms are fitted with standard amenities including complementary Wi-Fi access, iPod docking station, premium cable TV, coffee maker, modern furnishings and comfortable beds with pillow top mattresses. You can enjoy breakfast and lunch at the Over Easy Restaurant. Parking and health facility are not available at the hotel, but you can find them nearby the hotel. Holiday Inn Bloor Yorkville is a good bargain in upscale Bloor-Yorkville area packed with posh luxury hotels. If you're looking for a clean and comfortable mid-range hotel in the area, this is the place for you. The hotel is perfectly located minutes away from the fashionable Yorkville area, famous for its designer boutiques, elegant restaurants, trendy spas, antique shops, famous museums and art-galleries. With its close proximity to area's cultural attractions including the Bata Shoe Museum, Royal Ontario Museum, Royal Conservatory of Music, Gardiner Museum of Ceramic Arts, Casa Loma, Art Gallery of Ontario and Chinatown, Holiday Inn Bloor Yorkville is a great hotel for leisure travelers. The well-appointed and spacious guest rooms and suites offer comfortable accommodation with modern amenities including complimentary high-speed wireless internet. The hotel features British-Style pub, the Fox & Fiddle. The hotel also offers free access to Miles Nadal JCC, state-of-the-art fitness facility just a block from the hotel. The centre has a swimming pool, massage, whirlpool, sauna/steam room and gymnasium. The hotel is just one block from the St. George subway station, allowing you to explore other downtown attractions without a hassle. The Radisson Hotel Admiral Toronto-Harbourfornt is one of the mid-range budget hotels situated on the Toronto harbour. The boutique style hotel offers spectacular views of Lake Ontario and Toronto skyline including the CN Tower. If you're attending a baseball game, the hotel is an excellent choice with its convenient location just 3 blocks from the Rogers Centre. The spacious rooms and suites boast panoramic views of harbour and city. Excellent amenities and facilities including complementary high-speed, wireless internet, a large work desk, premium cable TV and comfy bedding make your stay very enjoyable and satisfying. Experience culinary delights at the Watermark Restaurant and Lounge overlooking Lake Ontario and Toronto Islands. Relaxing in an outdoor swimming pool staring at the CN Tower is also a remarkable experience. Or take advantage of the fully renovated fitness centre with a variety of cardiovascular and weight training equipment. The hotel is minutes from the CN Tower, Air Canada Centre, Metro Toronto Convention Centre and Toronto Islands ferry dock. With public transportation (street car stop) conveniently located at its doorstep, all attractions of the downtown Toronto are easily accessible. Well, what should I say about this wonderful hotel! If you are looking for a 5 star ambience with 3 star prices, this is the hotel for you. 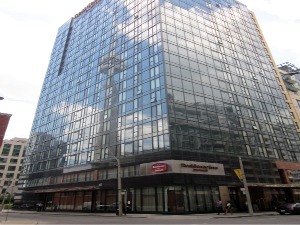 Located in the heart of famed Entertainment District, the Residence Inn by Marriott Toronto Downtown is one of the best mid-range budget hotels in Toronto with all modern amenities and offers the most bang for the buck! With 256 elegant, outsized suites, the hotel is perfect for leisure and family travelers. The suites are outfitted with sleeper sofa, 32" LCD TV, complementary Wi-Fi, work desks, extravagant and plush bedding. The suites also feature fully equipped kitchens with fridge, stove tops, microwave, dishwasher and coffeemaker. Savour the complementary, sumptuous buffet breakfast featuring more than 60 items or enjoy free supper in the evening. Relax and unwind in the indoor swimming pool, Jacuzzi or modern fitness centre. The best benefit of the hotel is its proximity to many major attractions. 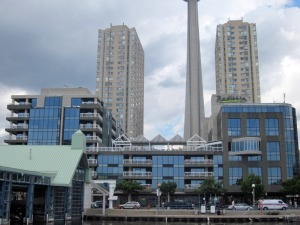 The hotel is very close to the Metro Toronto Convention Centre, Rogers Centre, CN Tower and Harbourfront. The hotel also provides easy access to area's best theatres, fantastic restaurants and fascinating nightlife. You'll never go wrong by staying at this hotel on your next Toronto getaway. Mark my words! 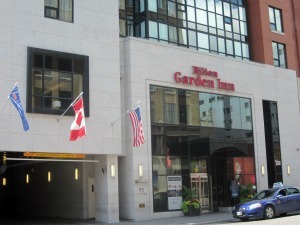 Encircled by many top Toronto attractions, the Hilton Garden Inn Toronto Downtown is fairly new property and one of the most popular mid-range budget hotels in Toronto downtown. The hotel offers modern and immaculate guest rooms and suites. The large rooms feature comfortable beds, high quality linens and cozy duvet, large work desk with ergonomic Herman Miller Mirra chair, 37" LCD TV, complimentary high-speed internet, refrigerator, microwave and coffee maker. For your fitness and recreation, the hotel offers on-site fitness centre, an indoor swimming pool and a whirlpool. You can enjoy a freshly prepared breakfast and dinner at the Marquis Bistro or relax in a quiet and cozy Marquis Lounge watching a game on 42" plasma TV. CN Tower, Rogers Centre, Chinatown and Metro Toronto Convention Centre are just short walking distance from the hotel. Since the hotel is close to many theatres, there's always a top-notch performance to enjoy. 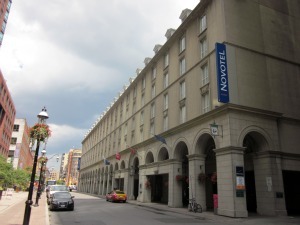 The Novotel Toronto Centre is a reasonably good hotel with convenient central location in downtown Toronto, just a short walk from the Union Station. 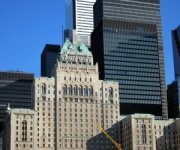 There are several major attractions near the hotel including the Hockey Hall of Fame, Air Canada Centre, Sony Centre of Performing Arts and St. Lawrence market. Across the street, you will find many decent restaurants and bars. Financial District is also 15 minutes of walk from the hotel. The spacious and clean rooms come with Wi-Fi, iPod docking station, coffee maker, comfortable beds and en suite bath. The hotel staff is very friendly and helpful. The hotel features on-site Cafe Nicole restaurant, Stage Door lounge, generously-sized fitness centre and an indoor heated pool with sauna and Jacuzzi. Try excellent buffet breakfast at the hotel. The sumptuous buffet offers a wide variety of food - eggs, cereal, breads, muffins, pastries, tea, coffee, juice and fruits. The Delta Chelsea Toronto - Canada's largest hotel is located in the heart of downtown Toronto and within walking distance of the financial district, the Toronto Eaton Centre, Yonge-Dundas Square, incredible live theatre, animated nightlife and electrifying attractions. With approximately 1,590 rooms from single deluxe to spacious family suites, the Delta Chelsea caters to a wide range of tourists, from families to business executives. The unique blend of modern design and urban elegance offers guests the utmost in comfort and luxury. 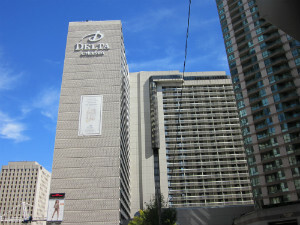 The Delta Chelsea is one of the best family-friendly mid-range budget hotels in Toronto. The fully equipped two bedroom apartment-style Family Fun Suites are 600 square feet and feature a kitchen, living room and a play area for children. The suites offer kids' special amenities including step-up stools, children's chairs, cookie jars, alphabet fridge magnets, in-room DVD and X-BOX with free access to movies and video games at the Kid Centre, bunk-beds and take-home gifts. If you are travelling with kids, don't forget to visit the Family Fun Zone on second floor. It features a family pool with a 130ft indoor 'Corkscrew' waterslide - downtown Toronto's only indoor waterslide, Club 33 teen lounge and Kid Centre. Kids really love this place! There is also adults-only indoor pool and whirlpool to relax and a health club to maintain your fitness routine. The award winning Elmwood Spa features numerous treatment rooms and Water Therapies, including a swimming pool, whirlpool and steam rooms. The hotel has several restaurants serving delicious cuisines and premium cocktails.